Petrotech Enterprises L.L.C. has been a reputed name in the Oil & Gas Refineries, Hydrocarbon, Petro-chemical, Marine – Onshore & Offshore, Power Plant, Water Treatment Industries. For the past 30 years, we have catered to Middle East, Europe, CIS, Indian Subcontinent, and other GCC regions by providing unmatched quality products, excellent customer service and a host of value added services to our client. To cater to our growing customer base we have expanded our reach by opening branches in Abu Dhabi and Sharjah (U.A.E. ), Muscat (Oman), Kuwait & India. 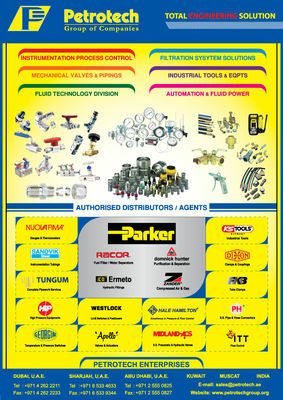 We undertake turnkey projects; provide equipment & accessories for installation & commissioning. We also provide training for our valued customers. Our team is specialized in System Integration, Service & Support of High Technology Hydro-Pneumatic Instrumentation, Tubing and Filtration Systems, & Mechanical Equipments.